We have loved busy bags at our house for years now, but I think this mix and match animals busy bag may be the cutest one that I've ever made. My boys have created many animal hybrids with this busy bag and the animals have sparked hours of creativity and imaginative play. But what I love, is that these mix and match animals are a great way to work on fine motor skills. When the animal's legs are clipped on, it can stand up on its own. And you can even clip different legs onto different animals. How about that zebra pig? Or the zebra with giraffe legs and a pig tail? Cute, right? Meanwhile, the kids are getting important fine motor practice in. Love this craft Dyan. 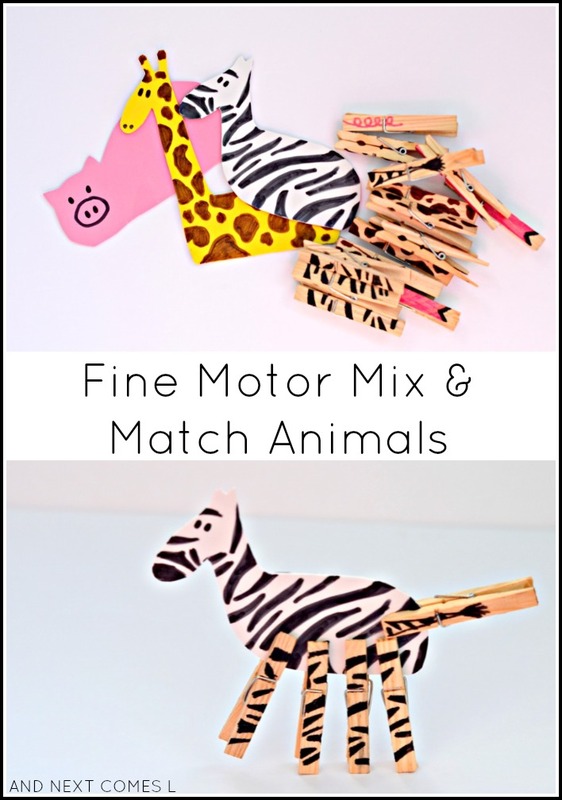 Its so simple and cute but a great fine motor skills builder!